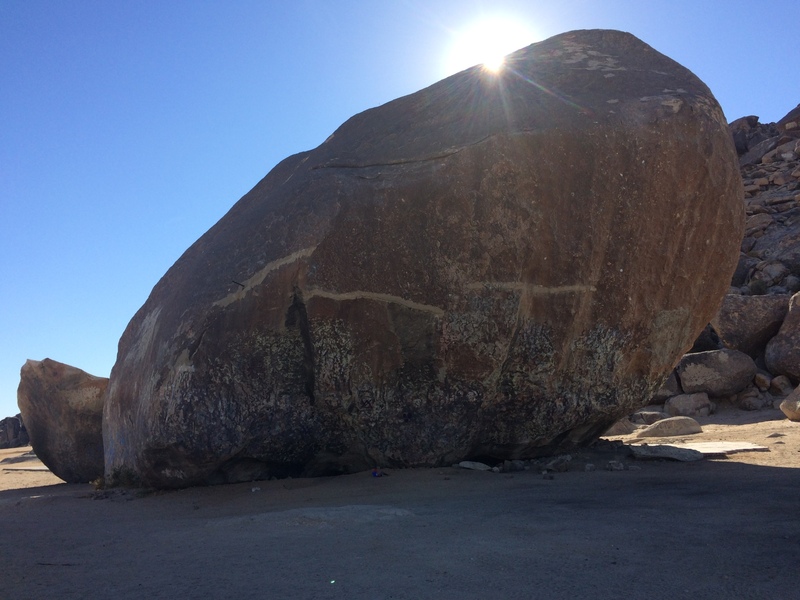 Sacred to Native Americans, ufologists and New Agers - what's so special about one giant rock? have such a place right here in Southern California. In a town called Landers, just north of Joshua Tree National Park, there is a place that has been described over the years as having electromagnetic forces, being the heart of Mother Earth, and as a point of contact for otherworldly beings. This place has been drawing people for thousands of years: Native American chiefs, scientists, ufologists, New Agers and plenty of the merely curious. While times continue to change, the explanation for what makes this place so special has changed right along with it. But the PLACE... the place remains the same. And that place is Giant Rock. center of prophecy known as Giant Rock. Giant Rock is a large freestanding boulder in the Mojave Desert. It covers 5,800 square feet of ground and is seven stories high. Giant Rock is purported to be the largest free standing boulder in the world. The granite stone and surrounding ground had been held as holy ground by the Serrano, the Chemehuevi, the Mohave, and the Cahuilla. It was reported by early white settlers that the tribes convened here to celebrate seasons, draw spiritual strength and prophesy. 400 square foot room for himself directly beneath Giant Rock, creating a single large subterranean home where he lived for a number of years. What happened next is told many different ways, but ultimately a trio of sheriffs came knocking on his cavern door, an exchange was had, dynamite was ignited and Critzer died in the blast. The burned out room was closed off for while... but something about Critzer's death resonated with a friend named George Van Tassel. Eventually, Van Tassel bought the property, gaining access to his late friend’s cavernous room . He began meditating regularly there. aging was caused by a loss of power. Soon, Van Tassel acquired a group of believers, who gathered regularly for his Friday night meditation and channeling sessions in Critzer’s old bunker beneath the base of Giant Rock (the room has since been filled in). By August 1953, Van Tassel believed the alien beings had given him a technique to rejuvenate human cell tissue. Van Tassel now claimed to have even been transported to an alien space ship, where he met a wise group of aliens known as the "Council of Seven Lights." Tassel said this extraterrestrial meeting, along with ideas from scientists such as Nikola Tesla, inspired the construction of a nearby building/device which was to be a "rejuvenation machine" he dubbed "The Integratron." While Van Tassel may have moved his source of spiritual inspiration a couple of miles down the road, others certainly never lost sight of the power at Giant Rock. Even today it beckons those who wish to meditate, pray or simply stand in awe of Mother Nature. And there are some who believe that in the year 2000, Giant Rock spoke back. Earth accepted the prayers that they offered, she asserted, then Giant Rock wouldcrack at the side. If the prayer offerings were not accepted, then Giant Rock would split directly down the middle. 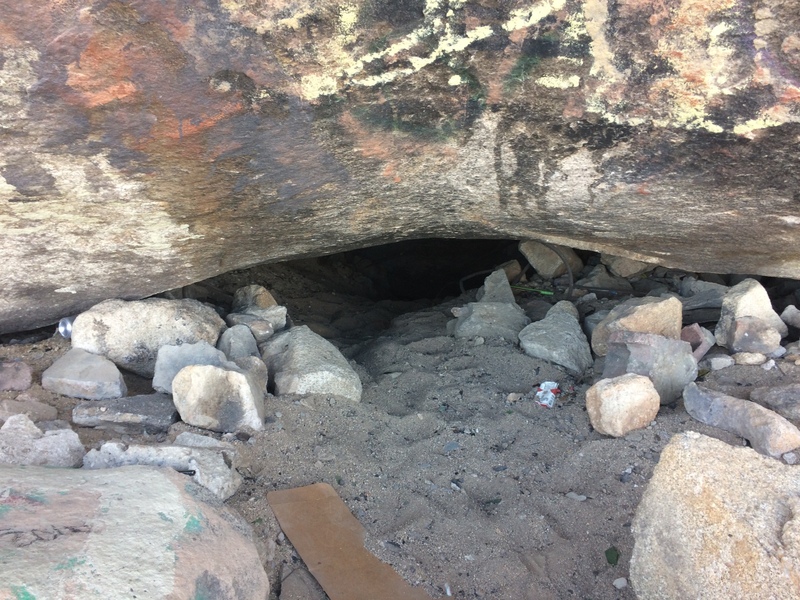 land, the Bureau of Land Management lacks the resources to monitor or even clean up after the constant dumping of garbage and debris, the shooting of fire arms and the tacky graffiti blighting the area. Giant Rock to its rightful place as a revered and unique historical site. This brings us to today’s guest, Barbara Harris. Barbara is the woman behind the Giant Rock Project, a group of primarily local volunteers who have a passion to educate, preserve and promote the legend of Giant Rock . "Life On Other Planets: The House the Venusians Built". The Independent. May 4 2006. Web. LeGrange, Barbara. "The Intrigue of Giant Rock." LucerneValley.net. via High Desert Star newspaper, Yucca Valley, Feb 2000. Royce. "The Amazing Splitting Of Van Tassel's 'Giant Rock' - A Prophecy Fulfilled?". Rense.com. March 5 2000. Web. Twyman, James. "Prophecy Rock Splits and Fulfills Native American Prophecy." 2012. Crawford2000.co.uk. Web. While a spiritual group from Los Angeles reported that they prayed and drummed for the rock to crack as a sign from Mother Earth - and the rock did crack a couple of days later - it was also reported in the news media that a local family had set fire to an old motor underneath the rock and it was the intense heat of the fire that resulted in the rock's break. Frank Critzer's family and friends acknowledge that he was a Nazi sympathizer BUT he was not German - nor was he an immigrant (he was born in Virginia of English ancestry). Our knowledge of the Native American's use of the rock comes entirely from a handwritten account by George Van Tassell as given to him by early area settler Charles Reche. No part of it has been able to be confirmed outside of that single account, however there is a large pictogram of a scorpion that was made onto the rock by a Native American at some point in the rock's past. Giant Rock is a boulder that was spewed out from a nearby volcano and is not rooted to any additional rock beneath the ground - tectonic plates or otherwise.